Back before I came down with the flu, slid into bed and pulled the covers up over my head for a while, Phil Thornton, a frequent contributor to this site, posed a couple of interesting questions. We’ll get to the second question another time, but here’s the first: Phil wondered when a recently uncovered photograph could have been taken, the one apparently showing Thomas and Orel Jane Lovewell in their verdant garden at the edge of the village of Lovewell, since Thomas seemed to spend every summer between 1901 and 1908 combing the hills of Wyoming and Colorado for gold. I usually date the photograph as c. 1902, mostly because the camera that very likely produced it was a Brownie model introduced in October 1901. One of only half a dozen known photographs of Thomas Lovewell, this one is a bit blurry. Orel Jane is gazing into an area that seems to be a garden because it's divided into rows, while Thomas is seated at the edge of what looks more like an untended yard that’s gone to seed. It reminds me of a particular lawn I used to mow in that region of Kansas many decades ago. The homeowner paid me a handsome price to mow it exactly once each summer, at the start of September. While 1902 was the earliest year the snapshot could have been taken, there are other candidates. We don’t yet have an exact itinerary for Thomas’s travels in the first decade of the 20th century, but we know that he did sometimes make his way home in time to bask in the last few rays of summer. Newspapers reported that Thomas Lovewell returned from Wyoming in late September of 1903, September 10th 1904, August 18th 1905, late October of 1906, and September 18th 1907. We have nothing definite on his return in 1902, but, because of an item in the May 5th, 1902, edition of the Laramie Boomerang, we know that he reached Wyoming very early that year, and was already setting out from Laramie "for the Independence mountains," although, as I’ve maintained, he very likely traveled to the vicinity of one Independence Mountain, located in Colorado. Getting such an early start, he also might have returned to Kansas earlier than usual in 1902, though we have no direct evidence that he did. 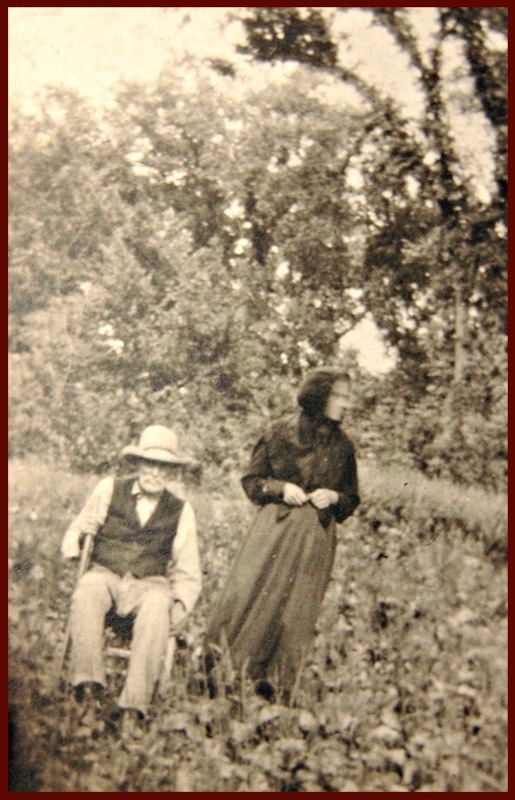 The photo was a Stofer family keepsake, one probably snapped by the Lovewells’ daughter, Mary Stofer, when she and her husband Ben visited her parents’ farm. Unfortunately, the comings and goings of Ben and Mary Stofer did not begin to be catalogued in the local press until 1903. For a couple who would spend the bulk of their lives in the Republican River valley, they demonstrated footloose behavior early on. After losing their first two infant children in the late 1890’s (see “Grief Encounter”) Ben and Mary Stofer tried to make a new start in Oklahoma, where their daughter Ethyle was born in 1901 or 1902. However, the couple must have returned to Kansas in 1902, because the Courtland Register in March 1903 records an impending auction, after which Ben and Mary intended to leave Courtland for Oklahoma. When they returned in April of the same year the paper commented that apparently “a week or two was enough for Ben.” Unable to find an empty house in Courtland, the couple moved to Formoso, five miles south of Courtland. Late in September 1904 Ben left for Oregon “where he will enjoy a hunt among the mountains. His wife expects to follow soon as they expect to make there (sic) home there.” Whether she joined him or not, the Stofers were next reported to be back in Formoso in February 1905, after cancelling a contract on another house in Courtland. We don’t know when Ben acquired his 40-acre farm southeast of the village of Lovewell, seven miles north of Formoso, but in October 1905 he “was up to his farm last Thursday, prospecting for water, he got eight ft of water so has again changed his mind and will build.” Illness delayed the family's relocation to the outskirts of Lovewell, but only slightly. The Februrary 23, 1906 edition of the Courtland Register reported that the “Ben Stoffer’s are out from under quarantine and have moved to the farm.” The family would remain there for nearly three decades, until a minor stroke and the Great Depression forced Ben into another line of work. In the end, we still don’t know for sure when the photograph in the garden was taken, but in the summer of 1905, Thomas Lovewell was definitely home early from his Wyoming adventures, and Ben Stofer could be found on his own farm only a mile away, scratching his head and wondering whether to build a house and move his growing family there. All the elements were in place that year, although I still have my eye on 1902, when the Stofers apparently moved back from Oklahoma with a thriving baby girl to show off to her grandparents, and might have been packing a camera that had been purchased to record her every milestone. Another reason I’d guess the year of the photo to be 1902, is that I can imagine Thomas upgrading his wardrobe to impress his cousin, Joseph Taplin Lovewell, when the prospector met the professor in Topeka in October. 1902 was also the year several local papers happened to reprint a story from a quarter-century earlier. Besides dusting off the old piece, the Courtland Register decided to append an update. In reproducing items from 25 years ago, in the Telescope of last week we notice the following: Our old friend Tom Lovewell, of White Rock, gave us a pleasant call, Friday. Tom rode into town on the finest three year old colt we have seen in the county, which purposes keeping as a stock animal. Mr. Lovewell is now 74 years old and is in the Wyoming gold fields. He is quite spry for his age and has staked a claim almost 50 miles from Laramie City, which at this date is very promising for the yellow metal. In pioneer days he was an Indian scout and made several trips along the White Rock and further west and is as well posted upon the early history of this section as any one you can find. Perhaps, as Phil Thornton suggested, the hat and vest Thomas wore in the picture were bona-fide cowboy garb he had picked up at a Western haberdashery in Laramie, something befitting a prosperous cattleman and landowner, certain that he was about to find the bonanza that had eluded him for so long. This may have been his little-red-sports-car moment, captured for posterity.